I think there’s only three cartridges in this pack, so it would be nine cartridges for £17.98. I swear they deliberately make it confusing by prominently stating “4 blades” on it, but that’s just the number of blades per cartridge. I know, but you don't mention the quantity in the thread title. 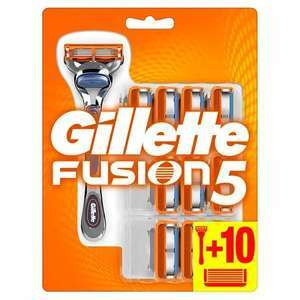 Thanks OP got 2 packets of Gillette Fusion proglide for £27.00 ! bloody, handle and 11 blades already sold out! I prefer diluted detol to this. Forgot to say there is also a trimming tool that flips up at the back of the shaver for side burns and tidying neck hair. Not obvious from some pics. Thanks, bought one yesterday tried it this morning after a 4 hour charge (note only comes with 2 pin shaver plug so needs adaptor) on 2 days pf stubble and it worked really well. Gave a smoother closer shave than my old series 3 Braun shaver. I also noticed that Amazon was doing it for the same price yesterday. Blades work out to be £1.50 each! A nice little set. Works well at removing hair from the nose and ears. What more could you want for £1? Funnily enough, I did this to boyf the other day (cotton bud + hot wax up the nose, wait for it to harden, then yank it out) Though, Poundland have sold £1 battery nasal hair trimmers for years and years. A friend of mine was given some for Xmas by his nipper, he opened the box, switched it on and shoved it up his nose.....trouble was the battery died straight away and it stopped before it had cut anything.... he couldn’t get it out without pulling all the hair out with it.....he cried that day!! Never miss a 'Shaving & Hair Removal' deal again! As a business they are dead to me. Carry on if you wish. I have stopped using them. I have a close electric beard trimmer now I use all the time. I’ve taken my business elsewhere. We know Dave we know. You don’t like Gillette and you know how much Wilkinson do for the world around them. Wilkinson Sword better quality, better company. Maybe you paid the shipping costs using miles. Are these the best a man could get? 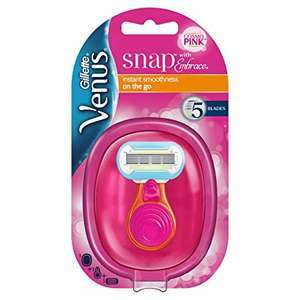 Ladies, or anyone's, intuition fab razor, half price at tecso. 4 quid. Bought the blades, good value if these are real ? Isn't that shown to not prove that an item is legit? It at least used to work so that if Amazon buys 10 boxes of these, and then seller X also buys 10 boxes of these and say they're the exact same product(same barcode and packaging etc) then in the warehouse all 20 boxes are pretty much now considered all the same and any box can be sent out no matter which seller you choose. People who sell and stock stuff in Amazon warehouses have said that when getting their products back they noticed that many are fakes and that's because their products were bundled with other sellers supplies and when they requested their stock back Amazon just grabs them at random. This is still likely real though since the price is the main concern and we know that Amazon is the one who set this price so the listing is at least legit. Being on sale often is not the same as the "usual price."